Rep. Steve Stafstrom (left) listening to Gov. Malloy at a State Capitol news conference announcing a federal grant award to Connecticut that provides approximately $38 million to Bridgeport to improve shoreline infrastructure and to prepare against future storms and flooding. Representative Steve Stafstrom (D-Bridgeport) welcomed the awarding of a federal grant to Connecticut that greatly benefitted Bridgeport to help pay and prepare for coastal flooding and climate change. Bridgeport’s portion of the $54 million federal award is estimated to be approximately $38 million. 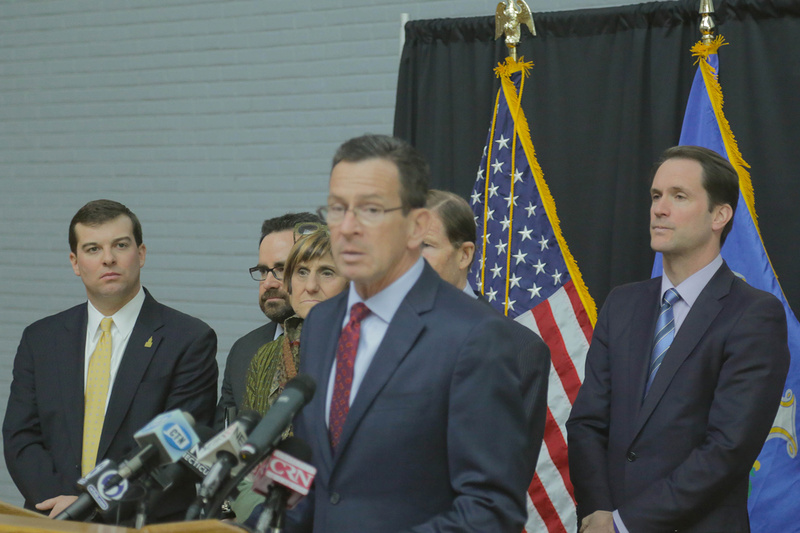 Rep. Stafstrom joined Governor Dannel P. Malloy, Senator Richard Blumenthal, Representative Jim Himes, and other members of Connecticut’s congressional delegation at a State Armory press conference to officially announce the awarding of the $54 million grant. The grant was awarded by the U.S. Department of Housing and Urban Development and the Rockefeller Foundation as part of the $1 billion National Disaster Resilience Competition for states and communities affected by major disasters between 2011 and 2013. South End East Resilience Network - $34,368,759: Elevation of University Avenue and construction of a greenway earthen berm to create a new baseline for the establishment of an urban coastal community that will be protected against future storms and sea level rise, removing the risk to reinvestment and inviting new development to strengthen this extension of downtown Bridgeport. Community Design Center - $1,000,000: Construction and rehabilitation of an anchor community center in the South End to serve as a design center and central location for future recovery efforts. South End District Energy Infrastructure Study - $350,000: Analysis of opportunities to utilize micro-grids, cogeneration systems, and alternative energy sources to limit disruptions in energy supply due to emergencies. Connecticut's entry on behalf of the state was put together by the Connecticut Institute for Resilience and Climate Adaptation, a joint center run by UConn and the state Department of Energy and Environmental Protection, the Office of Policy and Management and other departments.